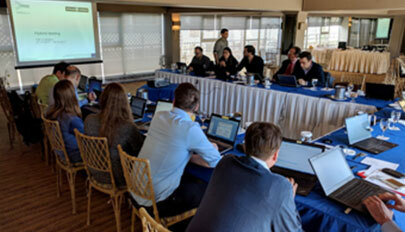 Last November, on the 27th and 28th, Inframix’s Plenary Meeting took place in Athens, Greece. Representatives from the project’s companies (as Tom Tom, BMW, Siemens, ASFINAG or Abertis among others) participated in technical discussions regarding Inframix’s status and next steps. After the key outcomes were presented, several issues were debated such as co-simulation environments, the roadway layout map and the parameters which should define them, the importance of real-time measurements of flow, speed and occupancy, automation level communication, hybrid testing, all subjects which will determine Inframix’s success. Next meeting: Berlin! This project has received funding from the European Union’s Horizon 2020 research and innovation programme under grant agreement no 723016.